What are the best features of the Celestron NexStar 130SLT Computerised Telescope? The Newtonian internal design configuration of the NexStar 130 SLT is refined to capture as much light as possible, and the precision optics will ensure that you get the most impressive focused images as possible. 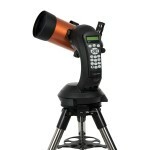 Yes, the Celestron NexStar 130SLT Computerised Telescope is a high precision optical instrument and the automatic sky mapping software makes this a very simple telescope to operate. The most impressive feature of the NexStar 130 SLT Telescope is that Celestron has integrated the wonderful SkyAlign technology which gives you the ability to completely automate your sky watching hobby. 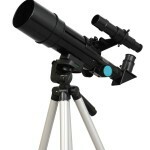 With SkyAlign you will no longer need to rely on a finder scope to align the telescope. With the power of computer automation all you need to do is enter the date and time. With a very rough aim – you still need to point it at three bright objects in the sky – the telescope is ready and the computer takes over and does all the hard work for you. SkyAlign is completely automatic and you can select any target object from the database, and the telescope will do everything for you, from aiming, to tracking and ensuring a sharp focus on the object no matter how fast it tracks across the sky, or how long you want to maintain your field of view. Not only is the computerised alignment a huge plus with this telescope, but the software that comes with it is also extremely useful and easy to use. The computer will give you the names of the target stars, and allows the telescope to find thousands of objects such as stars, planets, and galaxies by just pushing a button. Needless to say, by using the computer automation, you also have the bonus of much more accurate tracking than a human can manage, which makes it easy to get high power views of the planets. Here is a very handy trick – you can also navigate with the “Align with Two Stars” and “Align to the Solar System” modes which comes into its own early in the evening when not all the stars are visible yet. The NexStar SkyAlign system can get aligned and observing with just two objects such as Venus and Mars, depending on your location. By the time the heavens become fully dark, the Celestron NexStar 130 SLT is already on task and delivering the goods to you. 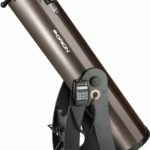 What are the downsides to the Celestron NexStar 130 SLT? To get the best out of this machine, you might need to buy some optional extras. Reflector telescopes are brilliant because they have such a large aperture size, and have more light gathering opportunity, but is packed into a smaller tube size. You to remember that all reflector telescopes require the mirrors to be aligned or “collimated” to keep them operating perfectly. In order to keep the instrument perfectly aligned and operating to the full potential, you may need to spend a short amount of time when you are not star gazing, to check your instruments alignment. Don’t be put off, this is not a complex task thanks to Celestron, you can use the NexStar Collimation Eyepiece to very simply adjust and correct for any mis-alignment, and be assured of the very best focus during your next astronomy session. 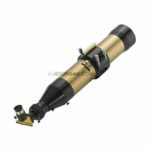 This telescope doesn’t come with a Barlow lens eyepiece, which is a really useful addition to any telescope and will give you much better magnification than what is provided in the box. I advise you to just get one straight away, and you’ll soon be using it every day as your primary eyepiece. The other thing you could look at buying is the AC power adaptor which is not included in the sale of this instrument. Otherwise you can probably expect to drain a set of batteries almost every night, which is fine if you are not within reach of a power source, but a bit of a pain if you want to leave the telescope set and in position for the next session. If the telescope goes flat, it will not keep the date, time or location data, and needs to be updated each time. The Celestron NexStar 130 SLT is very light and easy to transport. However, because it is so light, it does not have much weight or inertia to counter balance any bumps or vibration. This means it can tend to bounce and wobble during alignment and focusing. The only thing you can do is to wait for a short time for it to stabilize after any adjustment. A better way is to add some weight to the tripod tray to add extra stability to the telescope – but you will have to buy this extra. Or if you are like me, add a couple of bricks in there – it works just the same! What are the positive aspects of the Celestron NexStar 130SLT? 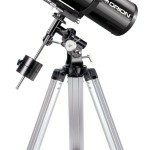 Where can I buy a Celestron NexStar 130 SLT Computerised Telescope? In summary, the NexStar 130 SLT is a brilliant telescope, especially as it comes fully equipped with the SkyAlign technology. It is completely automatic and you can select any target object from the database, and the telescope will do everything for you, from aiming, to tracking and ensuring a sharp focus on the object no matter how fast it tracks across the sky, or how long you want to maintain your field of view.